Book talk: Seth feels the impact of a rock against his head as the waters close in around him and he drowns. He dies in America, but he wakes up again in his childhood home in England. His neighbors' houses are exactly how he remembers them, except that nobody's home. He ventures into town for supplies and finds that nature has begun to reclaim the town with wild plants and animals. It's like nobody has lived there for years. He thinks he's in his own personal afterlife until he finds two others like him and a mysterious enemy that is hunting them all down. Rave: I always go into Patrick Ness novels expecting death, so I was actually a bit relieved when it came at the very beginning. I had hoped that would remove some of the suspense and eventual emotional devastation--oh how wrong I was! I think talking too much about the plot will just ruin it for people who haven't read it yet so I'll just say that I love the diversity of the characters, their layers that are revealed as the plot progresses, and the mind-trip that was the ever-twisting plot. Every book its reader: I'd give this to fans of both plot-focused science fiction like the Matrix and fans of realistic books about teens dealing with surviving all-too-real trauma. It can get pretty intense at times so I'd say 8th grade and up. 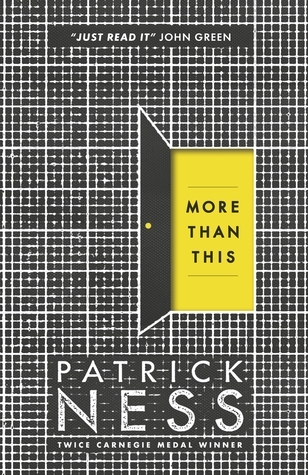 More than this by Patrick Ness: buy it or check it out today!